A California woman who underwent fertility treatments has given birth to octuplets, but a new test may make the implantation of multiple embryos unnecessary, as doctors can now check the viability of eggs before fertilization. In only the second live birth of octuplets in U.S. history, a woman delivered six boys and two girls on Monday at Kaiser Permanente Bellflour Medical Center by Caesarean section, according to USA Today. Doctors thought the woman was carrying seven babies, and were surprised when they found there was an eighth baby (a boy). The parent's names have not yet been released, but doctors say the babies weighed between 1 pound, 8 ounces, and 3 pounds, 4 ounces and were born nine weeks premature. Two were placed on ventilators that have now been removed, and a third needed oxygen, but they are all in stable condition. "It's a risky decision to try to have all eight babies," said Dr. Richard Paulson, director of the fertility program at the University of Southern California, who doesn't treat the octuplets. "I would not recommend it under any circumstances, but I respect a parent's decision." The first set of octuplets born in the United States were born three months premature in 1998. The smallest died a week after birth and the surviving children turned 10 in December. Dr. Mandhir Gupta, a neo-natologist caring for the new octuplets says the next week will be critical for the infants, who may be in incubators for six to eight weeks, and in the hospital for the next 10 weeks. "She's a very strong woman, so she probably will be able to handle all eight babies," said Dr. Gupta. But caring for eight children isn't simply a matter of a woman being strong or weak. The uterus is only capable of taking care of a certain amount of foetuses and multiples have a much higher risk of developing health problems or dying. Plus, taking care of eight babies is incredibly difficult for the parents, especially when trying to breastfeed all the babies, like the California mother says she intends to do. Doctors usually try to get mothers who have had several embryos implanted during in vitro fertilization to reduce the number of embryos, but the number of multiple births is still high. While of course, multiples rarely do occur naturally, The Times of London reports that in 2004 alone 19,049 babies were born in multiple births of two or more, amounting to one in every 67 births. The number of multiples born as a result of IVF may start to decline however, as doctors have developed a way to test the viability of eggs fertilization and implantation begin. Time reports that in two months, a previously childless 41-year-old British woman will give birth to the first baby who underwent the test. The main reason so many embryos are not viable during IVF procedures is that especially in older women, some eggs carry chromosomal abnormalities that make a full-term pregnancy impossible. Chromosomal testing damages the egg, but doctors have discovered that after eggs begin developing, half of the 46 chromosomes are shed and ticked into a genetic bundle called the polar body, which is safe to test. While as with other procedures that genetically test embryos babies in the womb, the procedure could theoretically allow parents to test for genetic diseases or more trivial things. 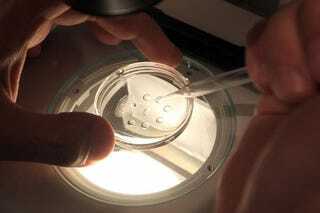 While some people are concerned the test could lead to people aborting babies with a certain hair or eye color, the test also holds the promise that a woman undergoing a costly and painful IVF procedure will be able to implant the number of embryos that she wants, rather than having to undergo several unsuccessful procedures, or implant multiple embryos and decide whether to reduce the number of embryos or deliver multiples in a risky pregnancy.